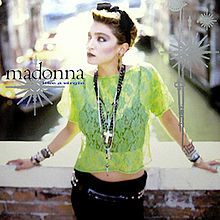 Released on November 6th 1984, Like A Virgin was the lead single and title track from the album, and gave Madonna her first number one in America. Produced by the legendary Nile Rodgers, the song peaked at #3 in the UK. I've always liked the beefy drum track on this tune which really makes you want to get up and dance - maybe not so much these days, though, now I'm in my 50s and have creaky knees! I also remember being very pleased that you got to hear more of the percussion in the 80s extended dance mix. The song wasn't actually written by Madonna but by Billy Steinberg and Tom Kelly, and, interestingly, Steinberg says he wrote it from his own personal sexual experiences and that it wasn't even intended to be sung by a female singer! 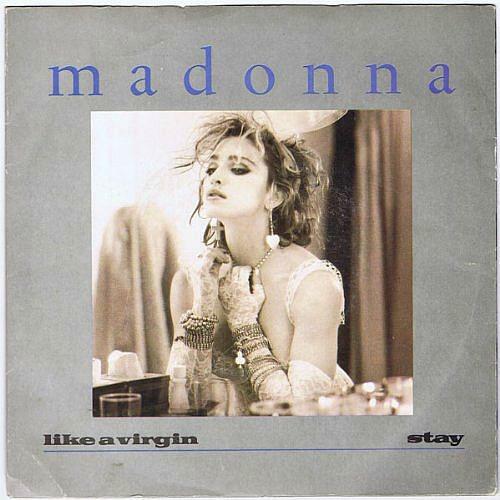 The B-side on both the 7" and 12" vinyl singles was the album version of "Stay". The video was directed by Mary Lambert, who also directed the video for the next single "Material Girl", as well as "Borderline", "La Isla Bonita" and "Like A Prayer". It was shot partly in New York City, but predominantly in venice. The singer wears a wide range of outfits, including a white wedding dress which she also wore while performing the song on The Virgin Tour during 1985. She can also be seen walking around the city, over bridges and riding in a gondola, but not while wearing the wedding dress! You will, no doubt, also have noticed a lion walking around the city. Apparently, it was rather disobedient and just did its own thing. At one point, he had his head in Madonna's crotch and let out a huge roar. Well, if I had my head in Madonna's crotch I would probably roar, too. Madonna's follow-up single, Material Girl (in which she mimics Marilyn Monroe) didn't quite hit the top spot, peaking at #2 in the U.S. and #3 in the UK. However, it did top the U.S. dance charts.